TAG Farnborough Airport today announced that it has been certified to the internationally recognised ISO 14001 standard for its commitment to environmental management. Miles Thomas and Holly Reeves from the airport’s Environment Management team were presented with the certificate by Allyson Lewis and Luke Lambourne from SGS, an independent auditing body, on 13 November 2015. ISO 14001 is an international standard that sets out requirements for an effective environment management system. It is designed to help businesses, including airports, evaluate and reduce the environmental impact of their operations. “Developing the airport responsibly has always been important to us. We are pleased to have achieved this internationally recognised certification for the environment management system we have developed and implemented,” said Miles Thomas, Environment Manager at TAG Farnborough Airport. “This accomplishment demonstrates that managing environmental issues is an integral part of our business operation. We are committed to working with our staff, tenants, suppliers and the local community with a view to continually improve environmental performance at TAG Farnborough Airport”, he added. The airport has introduced a number of environmental initiatives such as improving energy efficiency through investment in lighting and renewable technology, minimising waste to landfill, managing noise in the community and further reducing CO2 emissions through sustainable staff commuting. TAG Farnborough Airport is also part of the Airport Carbon Accreditation programme, which was launched in 2009 by Airports Council International (ACI) Europe. This independent programme recognises airports’ efforts to manage and reduce carbon emissions. The ‘Optimisation’ level awarded to TAG Farnborough Airport is the third of four levels of accreditation – ‘Mapping’, ‘Reduction’, ‘Optimisation’ and ‘Neutrality’ – which measure the step-by-step process towards comprehensive carbon management and carbon neutrality. As one of only four airports in the UK to reach the third level, it is on target to become one of the UK’s first ‘Neutrality’ accredited airports. TAG Farnborough Airport has been awarded ‘Best Handling Agent/FBO’ at the Baltic Air Charter Association (BACA) Autumn Lunch & Excellence Awards, held at London’s Guildhall on 14 October 2015. It is the second year in a row that TAG Farnborough Airport has topped the ‘Best Handling Agent/FBO’ category. BACA is a worldwide organisation for air charter professionals, representing the interests of 200 member companies, including brokers, charter airlines, airports, business aircraft operators and consultants. The winners of BACA’s Annual Awards are chosen by its membership. Miles Thomas, Environment Manager at TAG Farnborough Airport successfully completed fly2help’s Weekend Cycle Challenge 2015, an event that saw cyclists ride 170 miles from Farnborough Airport to Biggin Hill, Gatwick Airport, Brighton and back to Farnborough from 5 to 6 September 2015, in support of the charity. fly2help is a national aviation charity that inspires positive change through the wonder of flight. Its vision is for everyone to be able to access the positive benefits of aviation. The charity provides Air Smiles Days to people living in difficult situations. Aim High, its educational programme, encourages young people to consider a career in aviation. TAG Farnborough Airport also cycled to raise awareness of its Sustainable Staff Travel Plan, which encourages cycle commuting as part of a wider commitment to reducing carbon emissions. Saturday 20th June 2015, saw the largest ever turn out from the local community take part in the 4th Annual Twilight Runway Challenge despite the massive amount of rainfall!! 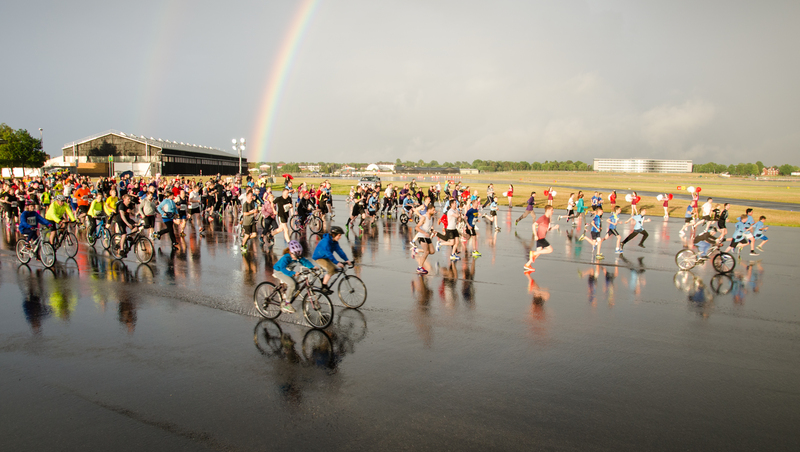 More than 350 cheerful participants lined up at the start line where a beautiful double rainbow came out to cheer on and support those who ran, cycled, walked, roller skated and unicycled their way around TAG Farnborough Airport’s runway and taxi ways for charity. We are delighted to confirm that in conjunction with 6th Form College Farnborough we have raised just over £5000!!! The funds will go towards the Community Matters Partnership Project Youth Aspiration Fund (YAF), which is used to provide grants to local projects that help young people to reach their true potential, from master classes in enterprise to mentoring and reading projects. Participant were from a number of CMPP partners including Aldershot Garrison, Capquest, Central Heating Services, Farnborough Business Park, Fluor, Hart and Rushmoor 19-14 Consortium, HRG, Knights Group, Rushmoor Borough Council, Source Supplies, TAG Farnborough Airport, The Sixth Form College Farnborough, Village Urban Resort and Zurich. Representatives from The Village Velocity Gym helped get everyone warmed up and ready to go, by leading all those taking part in a series of warm up exercises as well as providing goody bags for everybody who took on the challenge. 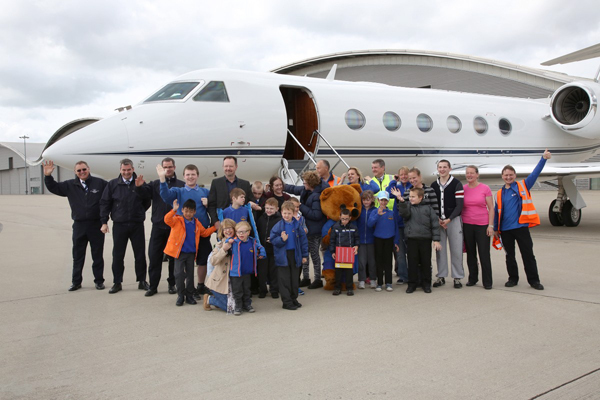 TAG Farnborough Airport hosted a fly2help Air Smiles Day on 1 June 2015 for 14 children and six teachers from Henry Tyndale Special School in Farnborough. The children flew on a business jet and toured the airport. 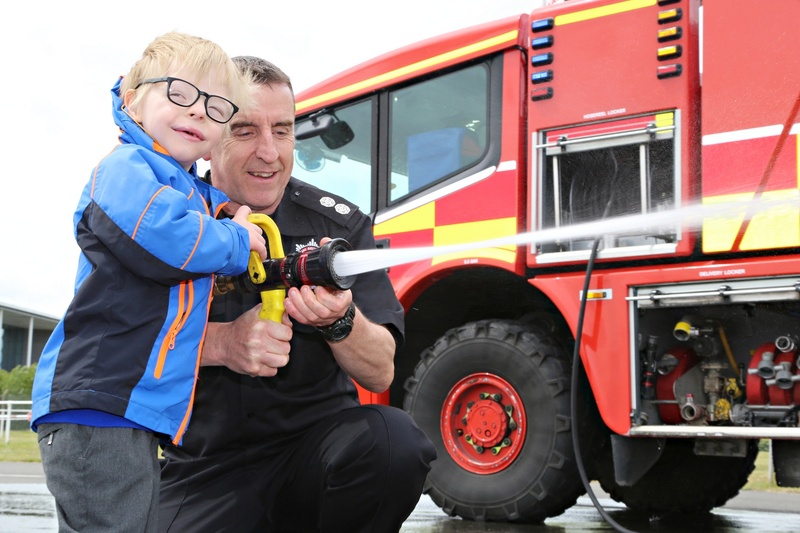 They also learned more about the life of a fire fighter at the airport and got to experience some of their equipment, including the fire engines.